I had the privilege of experiencing Carlos Celdran's (Manila's Tourism Consultant) FREE #VivaManila Walking Tour with several Pinoy Travel Bloggers last September. It happened right after our stopover at the Silahis Art & Artifacts in Intramuros. THE BEST THING'S IN LIFE ARE FREE! 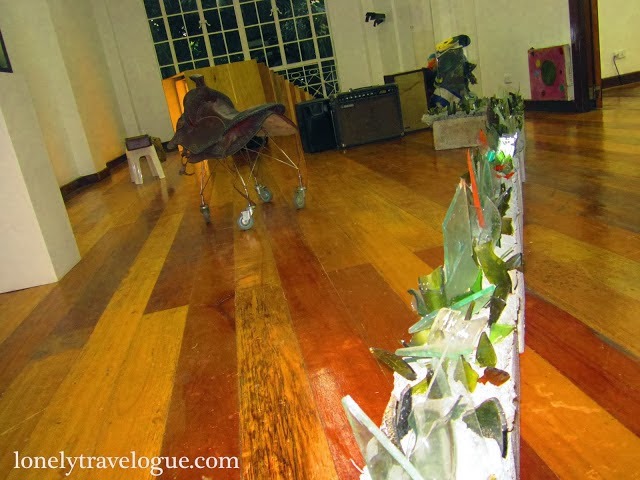 Carlos Celdran's Free #VivaManila Walking Tour definitely made this statement stand out. Why? Because other than giving out a free, no-frills tour around the City of Manila, he also graced us with his very boisterous yet down-to-earth character. Of course, the project itself is one to commend since Carlos' team (Mayor Joseph Estrada the guys at the Manila City Hall) aims to restore what the Filipinos once loved about the Philippine capital. Moreover, the tour was created to inform everyone that the bustling city is very much a walkable destination. You can certainly go from one interesting place to another just by using your feet and your wandering soul. ARRIVED JUST IN THE NICK OF TIME! We actually thought that the tour was going to start without us, as we were running a few minutes late. We actually had to scurry out of the cab to make it to the briefing. Fortunate for us, Carlos was still warming up, and was still walking around the MMDA Children's Road Safety Park wearing his bunny ears (just across Manila Zoo). But a few minutes later (around 3 PM), he started sharing how the MMDA was born (was initially referred to as the Metropolitan Manila Commission). I was surprised that Imelda Marcos was the first one to head the agency. Her late husband, President Ferdinand Marcos actually helped create the MMDA just so they could oversee the cities. Truth be told, I never really knew this side of Imelda. I mean, Mr. Celdran was able to share that the former Governor did a great job during her tenure, as she was able to push the development of several important infrastructures in Manila (i.e. Folks Art Theater). After that short introduction, Carlos and his student volunteers from FEU helped guide all of the guests to our next stop --- ERMITA (also known as hermitage in Spanish). All 160+ people were asked to prepare the exact jeepney fare (PHP8), as we were asked to head out to Ermita. So my group and I rode towards Padre Faura. When we arrived, Carlos briefed everyone again as to what to expect from the nearby attractions. He said that Ermita may have been long recognized for being a red light district. But the infamous establishments and the reputation that came with it were gradually 'cleaned up' during Mayor Alfredo Lim's tenure. Although the structures that did stay are of old, residential homes --- and Casa Tesoro's would have to be one of those iconic edifices. We explored the Art Deco inspired building, after browsing through the items from Tesoro's (was more like a 'KULTURA' store). We couldn't find anything that was worthy of purchase, so we immediately left for the art gallery nearby --- 1335 Mabini at Casa Tesoro. 1335 Mabini was an interesting art gallery. Of course, I was completely fascinated with the Philippine artworks that were put on display (from Wooden Sarimanoks to the large-sized Bulols). But apart from these antiquities, I also enjoyed the contemporary pieces from our modern day Filipino artists. There was actually one specific piece that intrigued my friends and I. And it was a long trail of hollow blocks that had pieces of broken glasses cemented on top of it. I've already seen that type on several houses in our village, as it's been put up as a means to protect the whole house from burglars. No one really knew what the artist meant by his creation (who recently passed on). But we did ask one of the curators what she thought about it. And she was nice enough to oblige us with her view of the "artsy piece". To her, the hollow blocks with the broken glasses represented how life should be perceived --- for you to be able to walk and to make decisions, one must try to be cautious at all times. When our time was up, Carlos huddled up the group again for several more stops. From 1335 Mabini, we walked towards the Solidaridad bookstore (which was closed at the time), and Hizon's Cakes & Pastries. Soon after that, we went straight to Jade Vine Restaurant and Executive Inn. It was relieving for everyone to finally seek refuge in Jade Vine, as the rain was starting to strengthen. It was also refreshing to finally sit on a chair, and be welcomed with good cheers from the staff members. Of course, nothing beats being served with free snacks after a tiring walk around Manila. Jade Vine was generous enough to feed all 160+ guests with some sandwiches, tacos and iced tea. After our time at Jade Vine, we headed towards Miramar Hotel by Roxas Boulevard. Now the Art Deco hotel was a sight to behold, as its whole structure was a visual treat (I just love all things vintage!). Furthermore, the nice part of the tour was being able to view some of the hotel's rooms. We got to a explore a few spaces, and were very much impressed with the interiors and furnishings. Before we left Miramar Hotel, Carlos Celdran graced everyone with a beautiful song number. He sang at the hotel's restaurant, where a foreigner was playing the piano (a guest who recently married a Filipina). So while the gentleman played the Piano, Carlos sang in the background. Believe me, Mr. Celdran was a great entertainer. I was really impressed with his singing voice. When we left the hotel, the guys at Gawad Kalinga also gave away a few of their organic juice blends. And since we were already rushing to our last stop (as the rain was about to pour once again), we all hurried towards Luneta. Believe it or not, it was my first time seeing Rizal's monument up close. So I was completely enthralled when Carlos asked everyone to huddle up for a 'class picture' with the iconic statue as our background. The walking tour was my first step out of the house, given my recent foot injury. There were several times when both my feet wanted to give in, as my soles were feeling the pain already. But it was the company of good friends, and of our bubbly tour guide that made that travel worth the pain. Truly, Carlos Celdran and his team are doing an awesome job promoting the City of Manila. That's why no matter how late this post may be, I never dusted away the opportunity to share my experience here. 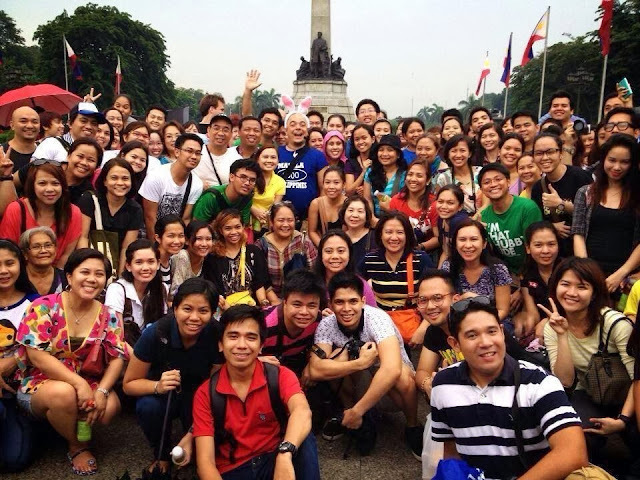 Here's to more #VivaManila Walking Tours!